Can you see the "Designed By Lisa Polderman"? Well, not ME - that's a model. But she's wearing my skirt! 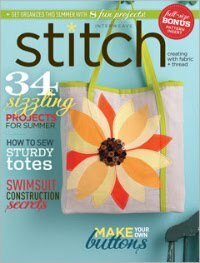 If you want to buy a copy, Stitch is available at Joann's Fabrics and some independent sewing stores (but not my local Hancock Fabrics, grr-blah) as well as online. 6 comments on "STITCH Magazine, Spring 2014"
Oh wow! Congratulations! That's so exciting. That's awesome, Lisa! Congratulations! Love your skirt!